"What’s the best soft sided storage for your fantasy theme world? Peel out of every stop and leave all over drivers in your dust! 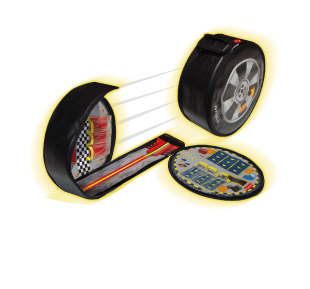 ZipBin® Wheelie Playset is the ultimate racing wheel with deep treads and the need for speed. Steer your Wheelie into any drag strip and watch the competition turn green with envy. 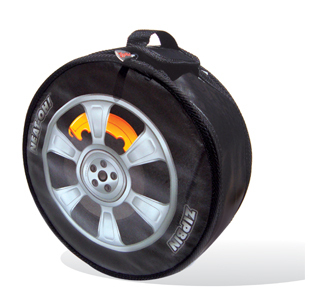 Roll up to the challenge and unzip the Wheelie to find the ultimate car storage bin. With more than enough parking for your ride and your fellow racers, it’s perfect for any outing. What we thought: D is in love with the Wheelie ZipBin! He finally has a place to store all his cars when he isn't playing with them so I love it too:) This fun ZipBin from the Shapes line has provided hours of engaging play for D. He loves to use it as a ramp to zoom his cars down, a racetrack and a mechanic's garage:) He is 3 now and all boy, so he "reviewed" the ZipBin very thoroughly. The ZipBin has stood up very well against all this "testing":) I absolutely love toys that are multi-functional and help clean up the clutter, so ZipBin is one of my top favorite gift ideas this holiday season! They have a pretty extensive line of full size and mini bins, shapes and backpacks, and lots more featuring Hot Wheels, Lego, Barbie and other kid classics like dinosaurs, dolls, unicorns...the list goes on and on and on:) ABCD Diaries gives ZipBin an A+! Buy It: Find these cool organizational tools at ZipBin! I entered but am not sure what I am entering for??? Is it the ZipBin Wheelie Playset? If so, very cool. We have lots of Hot Wheels. When does your giveaway end?